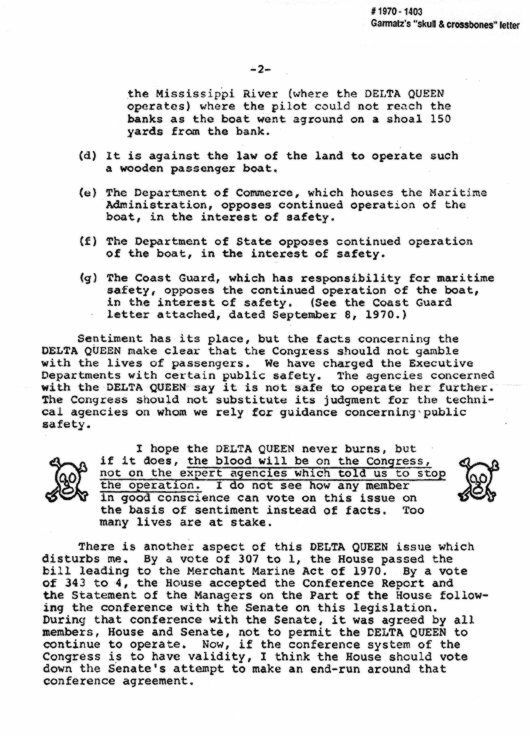 When the House of Representatives debated the fate of the Delta Queen in December 1970, Garmatz circulated this letter with a hand-drawn skull and crossbones. The says that if a disaster ever strikes the Delta Queen, "the blood would be on the hands of Congress." 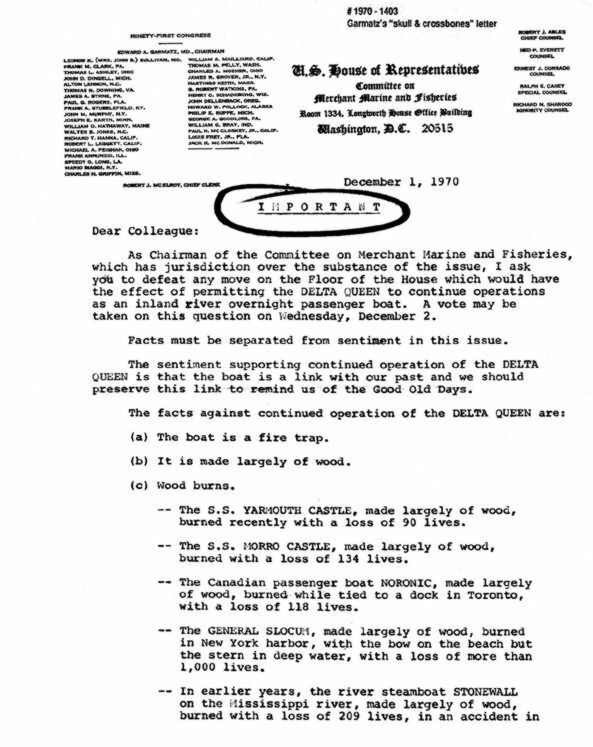 Here is the second page of Garmatz's letter condemning the Delta Queen. The incident was reported in the Cincinnati Enquirer and Cincinnati Post, Dec. 3; the December issue of Waterways Journal, and the Dec. 15 Congressional Record. 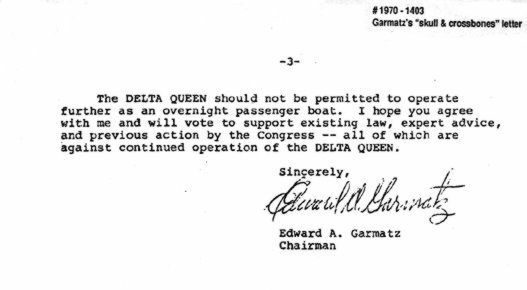 Editor's Note: The real reason Garmatz hated the Delta Queen was that Greene Line Steamers executives and their attorneys had refused to pay bribe money to Garmatz in exchange for favorable legislation. Allegedly, Garmatz was taking bribes from every barge company on the river. In 1977 a grand jury indicted Garmatz for bribery (concerning various barge and tow boat companies, not the Delta Queen). In 1978, shortly before Garmatz died, the charges were dropped due to his deteriorating health. It is ironic, that if the litigation had continued, Garmatz would have been tried in a court building named after him. Former Representative Edward A. Garmatz, a Democrat who represented Baltimore for 12 terms and headed the House Merchant Marine and Fisheries Committee, died of lung cancer at his home late Tuesday. He was 83 years old. Mr. Garmatz was seriously ill since the beginning of the year and was released from the Johns Hopkins Hospital July 1, Frank Lidinsky, his lawyer, said. Mr. Garmatz retired from politics in 1972 when reapportionment threw him into the same district as Paul S. Sarbanes, then a first-term Democratic Representative from Baltimore. Mr. Sarbanes, now a Senator, easily won re-election. Mr. Garmatz worked as an electrician before being elected to the 80th Congress in July 1947 to fill the vacancy caused by the resignation of Thomas D'Alesandro, who had been elected Mayor of Baltimore. Mr. Garmatz also had been a union leader, police magistrate and political organizer before going to Congress. He is survived by his wife, Ruth, and his sister, Elizabeth, of Washington.